A year before the 1991 Gulf War, I was studying yoga with a teacher who stressed our responsibilities to the world. Our internal states have a significant influence on the external world, he told us. If we create peace in our own bodies and minds, he said, the world becomes more peaceful; if we fight, attack, defend, and judge, those actions also have an effect on the world. If we create peace in our own bodies and minds, he said, the world becomes more peaceful; if we fight, attack, defend, and judge, those actions also have an effect on the world. At the time, my inner world was in turmoil, and it wasn’t until the Gulf War began that I actually committed to finding inner peace. I was in India when the fighting started, seeking to deepen my meditation practice, and when I remembered what my teacher had said, I realized I’d wasted precious time. As long as I was engaging in my own internal battles, I saw the violence in my thoughts, words, and actions would be reflected in the world around me. Creating peace was my responsibility—to others as well as to myself. I needed to do whatever it took to make peace within me. Every step I made toward that goal would be a movement away from war. But how was I to do this? I had once heard a famous teacher explain that he isn’t engaging in violence when he strikes someone holding a yoga pose—he’s seeing violence in a particular spot and striking that spot to bring the violence to consciousness. I wasn’t convinced this was a valid way of working with students, but the story had shown me that we are often unconscious of the ways we hold violence in our bodies. And I knew I had to find my own way of bringing unconscious habits of anger and violence to the surface so I would no longer project them onto the world. My negative reactions in certain situations and my hostile responses to various people, I realized, were evidence of my own internal aggression and had little to do with the outer circumstances. And as I tracked my negative responses I began to wonder what these aggressive states were. Where did they come from? How did they affect me internally and how were they defining my world? And what part did they play in the bigger picture? If I am angry with another driver and respond aggressively, for example, does that have a ripple effect? How much of what happens in the outer world can I honestly say has nothing to do with my own anger, greed, jealousy, and fears? What am I adding to the world? As I began to understand my internal states, I realized that when I am free of jealousy and self-doubt there is no reason to gossip. If I know that I harbor insecurities, I do not need to judge others for their shortcomings. Gradually I could learn to recognize and dissipate my anger instead of projecting it onto others. In the course of these inquiries I came to understand that I could use my asana practice to discover the source of my hidden aggression and make peace where the tension lies. In the course of these inquiries I came to understand that I could use my asana practice to discover the source of my hidden aggression and make peace where the tension lies. I could sit in greater stillness in meditation; I could live my life differently—and then the world would contain a bit less anger, hatred, fear, or jealousy. I had to stop my own moments of madness, so I began to explore my body for signs of aggression. I noticed where the tight spots habitually cropped up in my asana practice and in meditation, and made a commitment to bringing peaceful consciousness to these places. 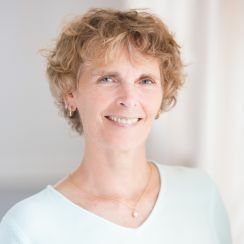 In my personal practice, as well as from my students’ feedback, I became aware of the way aggressive and negative reactions are reflected in disturbances in the organs and glands of the digestive, reproductive, and eliminatory systems. For example, fear and self-doubt upset the digestive system and can lead to eating disorders. Anger creates imbalances in the digestive fire, which can lead to heartburn, ulcers, colitis, indigestion, and liver disease. These disturbances are often caused by the unconscious habit of storing strong emotions in the abdominal area. And because physical constriction and emotional tension are interconnected, working with asana, I found, is a good way to bring these habits to our awareness. Becoming aware of this “holding” is the first step toward removing the blocks that prevent us from making a deep commitment to peace. So let’s begin with a simple movement. Start by lying on your back, knees bent, feet flat on the floor. Take a deep breath into the abdominal area, noticing any tight spots. As you exhale, exaggerate any tightness. The goal here is to simply be aware of the constriction, not to change it. Notice if there are any emotional responses or thoughts connected with areas of constriction. Release and take a few relaxed breaths. As you begin the next exhalation, contract the lower abdominals, and in a wave-like motion, continue the contraction into the upper abdominals. Without pausing, inhale and release the contraction in the upper abdominals first, then the lower. Do this wave of contraction and release for 5 full breaths, then relax completely. Bring any constrictions into your awareness. Judgment is a form of aggression, so the goal is to notice any constrictions in your abdomen without judging yourself. Simply observe with a peaceful mind. When you are ready, roll over onto your side and stand up. The following standing poses use movement to expand your recognition of tightness in the abdomen so you can begin to release it. With the knees slightly bent and the feet shoulder-distance apart, lean forward slightly and support the weight of your torso by placing your hands on the lower thighs. Exhaling, contract the lower abdominals and slowly continue the contraction to the upper abdominals. Without pausing, inhale and release the contraction in a downward-flowing movement. (This is the same movement you did earlier.) Repeat 3 times. Be aware of any areas of physical or emotional discomfort. With time, you will be able to bring these areas to consciousness and make peace with what you find here. Release the constrictions as much as you are able. Stand upright, bring your hands to the abdominal area, and breathe fully, feeling the movement of the breath in your hands. After a few relaxed breaths, contract the abdominal muscles and push the breath out through the mouth. Inhale through the nose while relaxing the abdomen. Try this several more times, making an audible sound with the exhalation. This pattern of abdominal breathing and audible exhalation prepares you for the woodchopper, an exercise that will further release emotional tension. The woodchopper is a simple movement that restores rhythmic breathing and engenders peace. Clasp the hands and bring them over the head. Bend the knees slightly. Swing the upper body and arms downward with an audible exhalation, as if you were chopping wood. Repeat this 3 times. Then return to standing, breathe fully, and let the breath descend into those places that were blocked. Let the breath do the last bit of discovery, acceptance, and/or cleansing for you. Deep, relaxed, even breathing can do much to restore peace and wisdom to areas of the body constricted by fear and anger. The next group of asanas brings us back to the floor to explore the more subtle areas of aggression and holding which tend to remain unconscious. Our negative reactions to the world are often stored here. Lie face down in makarasana, crocodile pose. The forehead rests on the forearms, hands resting on the elbows. The legs are wide apart, toes pointing outward. Let your belly and pelvis relax completely. Breathe into the navel and take time to explore any emotions and thoughts that arise. Notice whatever comes up without judgment. Bring the feet together and the arms to the side for a modified shalabhasana, locust pose. Tilt the pelvis—the tail bone moves down and the pubic bone moves toward the navel. The forehead rests gently on the floor. Keep the head relaxed and the back of the neck long. Squeeze the buttocks tight and lift the legs, keeping them together. Continue to breathe easily and feel the pressure this pose places on the abdomen. Now release completely and let the breath move freely through the entire abdomen. Repeat this pose and be aware of any constrictions. To challenge yourself further, lift both the upper body and the legs in the more traditional shalabhasana. Be sure to tilt the pelvis and tighten the buttocks to protect the lower back. Release the pose briefly and then repeat. Releasing, rest and watch the breath. Let the breath guide you. Become involved in self-discovery. Make peace with what you find. Become involved in self-discovery. Make peace with what you find. For bhujangasana, cobra pose, place the hands underneath the armpits. Keep the feet together and the legs on the floor. Tilt the pelvis and tighten the buttocks. Using the strength of the upper back muscles, lift the head and shoulders. Continue lifting the upper body by pressing down with the hands and stretching the arms. When your arms are extended, again tilt the pelvis strongly, squeeze the buttocks tighter, and draw the belly forward and up, away from the pubic bone. Hold for a few breaths and then release completely. Repeat the pose, then rest with the head, chest, and belly on the floor. Separate the legs and turn the feet out. Follow the breath into the abdomen and back. Dhanurasana, bow pose, is the next challenge. Repeat shalabhasana, and while holding the pose, bend the knees and reach back to clasp the ankles with your hands. This puts the weight of the body on the abdomen and is very good for cleansing, releasing, and balancing. You must keep the pelvis tilted and the buttocks tight to protect the lower back. Breathe smoothly and evenly while in the pose and, upon release, let the breath find its own way. The subtle aspects of the breath can begin to revitalize areas that have become deadened. Repeat the pose, enjoying any newly awakened areas. This sequence may have brought hidden areas of disturbance to your awareness. There is no need to try to change them—once you become aware of it, the energy gradually dissipates. The last few asanas in this sequence are designed to calm, soothe, and restore balance to both body and mind. Move into table pose, letting the back be in neutral. Breathe into the back and the front of the torso. Slowly begin to move from side to side, right hip to right shoulder, then left hip to left shoulder, like a cat seeking its own tail. Feel the spinal muscles release from the contractions of the backbending poses. Then come to center and gently move the spine up and down, in the cat-cow stretch. Again, let the spinal muscles begin to relax. Now lie on your back with the feet on the floor and rock the knees from side to side, releasing any tension remaining in the back muscles. Notice the quality of your thoughts and emotions without getting involved with them. Observe them as you would a tight muscle and release them. For an easy supine twist, bring the knees to center. Pressing down with the feet, lift the pelvis off the floor, swing it to the right, and place it back down, so your spine is now slightly askew. Bring both knees up and drop them to the left so you are in a twist. This gentle stretch opens and releases the abdomen. Let the breath come in and soothe the muscles, organs, glands, and bones of the torso. Repeat on the other side. Release and let a sense of peace flow through you. Next bring the knees up to the abdomen and release the back. In this position you can feel the breath moving a little deeper into the back of the abdomen. Let it go where it will. Follow it with your awareness. If you find any places of fear, doubt, or aggression, let the breath bring comfort and peace. Let a feeling of peace slip into your bones, body, heart, and mind. Finally come into shavasana. Make sure you are comfortable. Stay here for a full 10 minutes, absorbing the breath. Let a feeling of peace slip into your bones, body, heart, and mind. Invite the breath into any places where you may still have constrictions or tension. Bring the attitude of peace to places within that may still be struggling. Give yourself time. When you are ready, roll over and sit up. As you go about your day, practice peace toward yourself and others.